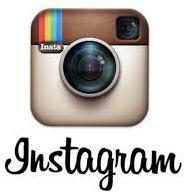 Feedback: 182 comments - leave yours! My friend Zed is good friend with a young Moldavian chap who works for a large multinational here in Switzerland. The Moldavian - let's call him that - goes back to visit his family twice a year and last time, he invited Zed along. Moldavia is not the most advanced country in Europe. Stuck between the back of Romania and the Ukraine, it is a bit forgotten by both Europe and the former East block. 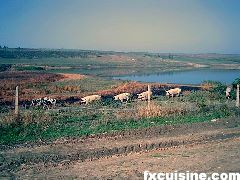 Moldavians live much like we did a hundred years ago. The Moldavian's parents have electricity but no running water and no heating system in most of their house. 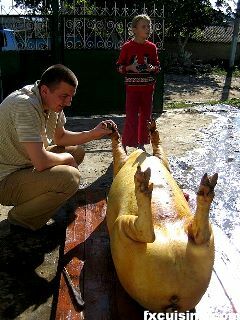 As a gift to his parents, the Moldavian bought them a pig that they could slaughter and feast on its meat for weeks. 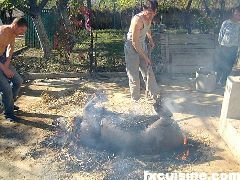 Whatever you think of pig-eating, please do not judge these people. They live like we did 100 years ago, including your grandma. 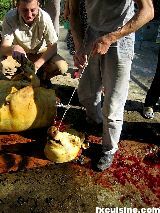 Slaughtering animals at home was very common all across Europe only two generations ago. Both my parents saw their parents do it when they were little. 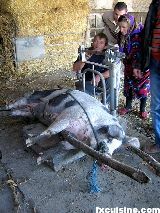 My grandfather would fatten a pig for a whole year, then slaughter him himself in the barn and bring the meat home. This was called faire la boucherie 'to do the butchery'. 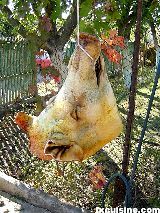 In my Italian cookbooks many traditional recipes use pig blood and guts, ingredients one didn't want to see lost during the maialata - the pig slaughter. 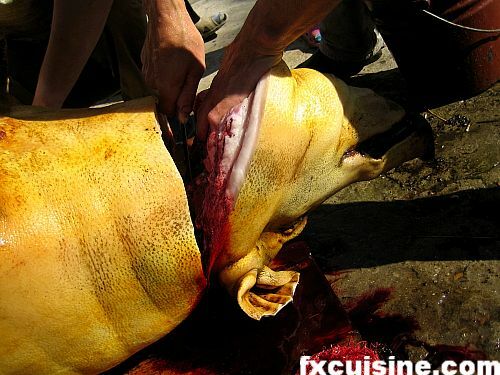 I have never seen this for real and wouldn't have the stomach to select a live pig, drive him home and cut his throat. That's too much for me and you'll see what it looks like hereafter. But I eat bacon and ham and who would I be to refuse to look at where this food is coming from? WARNING! 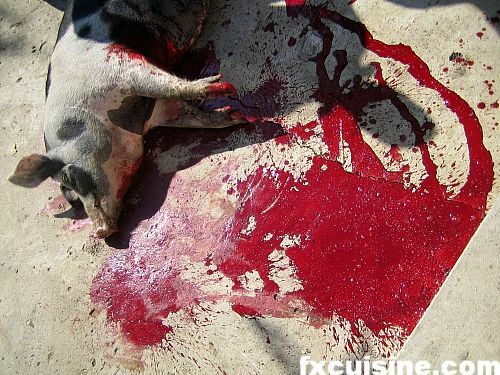 This article contains extremely graphic pictures of a pig being slaughtered. This is what happens everytime you buy bacon, but it may shock you. If you have predispositions toward vegetables, this article might turn you into a vegetarian for good. Not for the faint-hearted or those whose heart is prone to bleeding. You've been told. 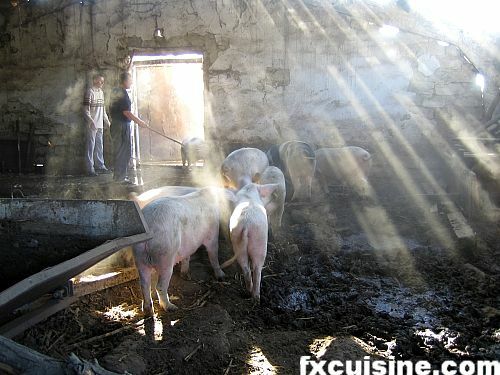 The pigs are raised in the Moldavian countryside and can run around all day. 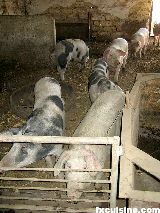 Inside the pig stall - the pigs are very clean indeed. Left, the fateful moment where the pig is chosen. 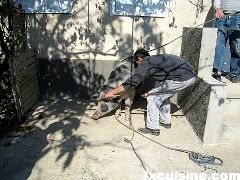 Middle the Moldavian's mother inspects the bound pig being weighed. 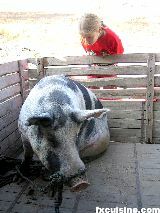 Right, the pig is taken for one last ride while a little girl looks at him up close. And now for our more dreadful sacrifice. 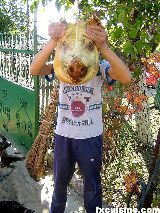 A Moldavian with a knife quickly pushes the blade in the place nearest to the pig's heart. Blood flows. 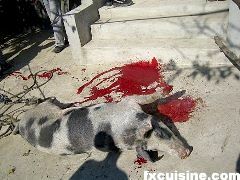 The pig dies by blood loss in less than a minute. If this is as much as you can bear, please stop now. Pigs are furry animals. 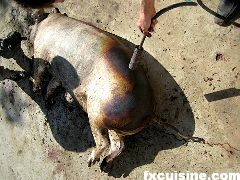 Three Moldavians with blowtorches burn every hair on the dead pig's body. 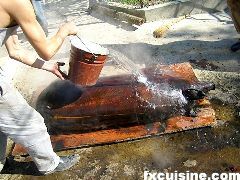 The pig's skin has turned black because of the flames, but the like-in-the-good-old-days taste is still missing. 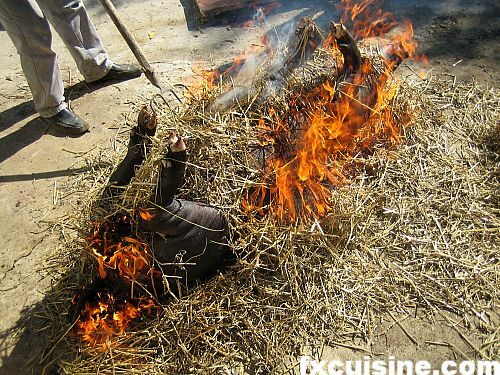 The pig is covered with straw and set on fire to infuse him with that elusive smokey taste. Buckets of water extinguish the fire. 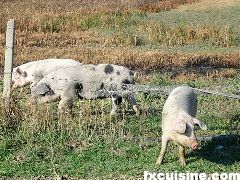 The pig is covered with a sheet. 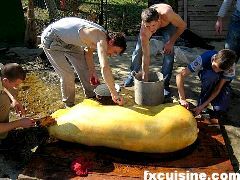 It is considered good fortune to sit on the carcass, family style like above or like the lads. 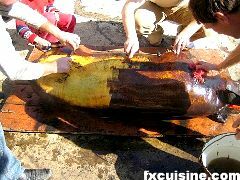 Four Moldavians now scrape the skin, revealing a clean, appetizing, yellowish underskin. LAST WARNING! 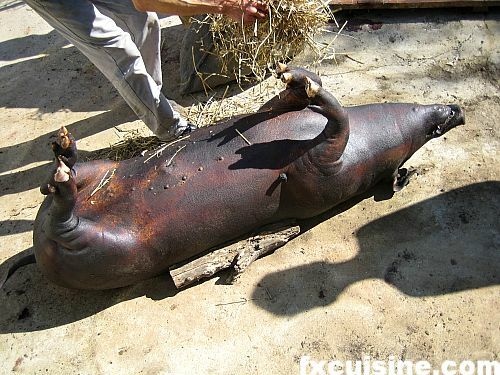 This article contains extremely graphic pictures - stop here if you feel unconfortable. ...then ties it with a string and hangs it for the lads to play with. You might notice that the ears' tips have been cut off. Somebody ate them - a treat really. 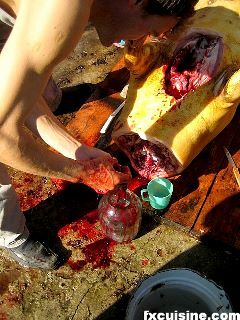 Now let's do the dirty - carve the pig open and grab his heart ... (upper right) and store the blood in a jar for later use (left).